As our month draws to a close, I made a card with my favorite cat of all time and he's my WOO HOO Cat today. He's a cutie and I had to play with him one more time this month. I'm sure he'll be back to say hi again! Love him that much! 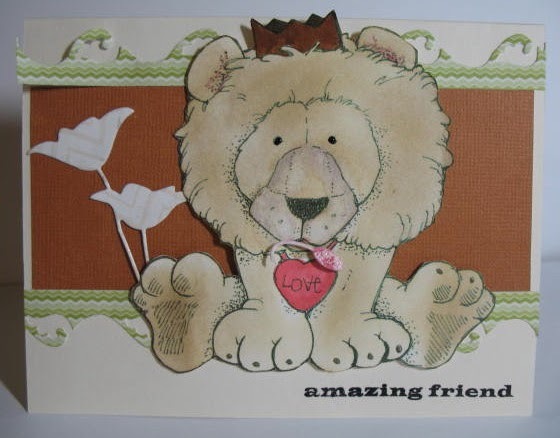 Thank you to Eureka Stamps and QKR Stampede for sponsoring the Die Cut Divas this month! We appreciate your sponsorship! Still time to enter our challenge for August. I'm on a Rocket Ship to Mars. You can see how easy it was to pop in a sentiment with this design. I hope you realize this border is actually the sides of a die-cut that you would normally toss. I thought it created a unique border and just that something different that you might look for. SAVE your scraps. Oh, I forgot I was "talking to the choir" of stampers. 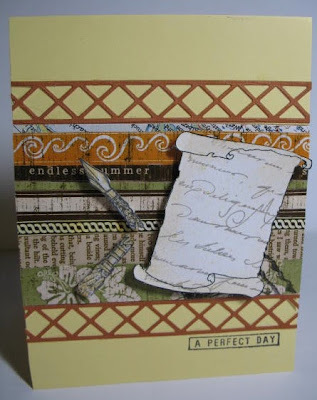 Remember that the Die Cut Divas' challenge for August is still going strong. You have got to love the sketch because it SO works as a basic model and sometimes what you need is a basic model. I do LOVE this sketch. Now go enter the challenge here. 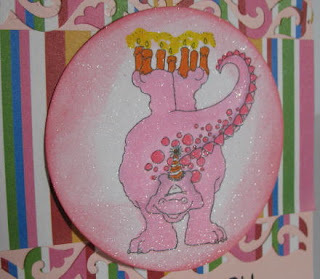 Here we have Pink, the pink Dino. I think he's male because he just has that look in his eyes.... But he's playful and can juggle pretty well too. 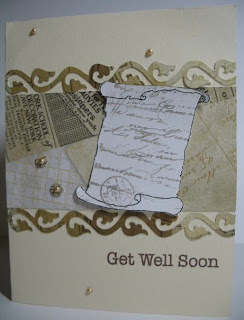 I used this stripy paper and die cut the borders with the same paper to see what the effect would be. 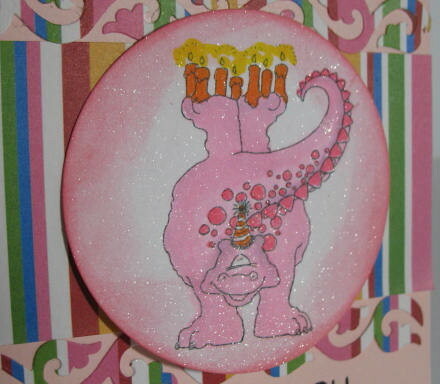 I kind of like the wild sense of adventure it gives the card, as if a pink dinosaur doesn't give you a sense of humor. A fun crazy digital stamp from Eureka for your enjoyment. Do you notice the circle panel is all shimmery? I have fallen in love with Tsukineko brand Sparkle Shimmer Spray. Look at that sparkle. Be sure to enter our challenge for August. I love sketches and this is a great sketch that can be used in so many different ways! I Think I LOVE This CAT! 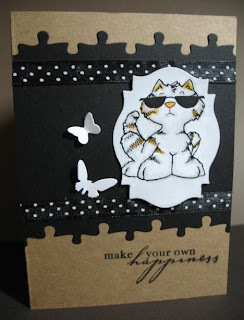 This time, this KOOL cat from Eureka Stamps is making a statement and I think you better follow it! This card came together in 20 minutes because of Paula's great sketch. So I just had to post it. Be sure to enter the current challenge here. I'm back again today with another take on the sketch. This time I have really stepped out & used different shapes to make the sketch. This is why I love sketches so much. You can do anything with them. I really had a lot of fun colouring in this cute Dog. I even added Star Dust Stickles to stars, just because I wanted to add a bit of bling. Thanks for stopping by today. I hope I've inspired you to create something. Die Cut Divas, let’s get to know.............? I was born and raised in Pennsylvania, USA. We moved to California when I was 16 and I have to say I’m pretty much a California girl. Wouldn’t really want to move and live anywhere else now. We all complain about the heat in the summer and the rain in the winter, but all in all, I like it here. I can drive two hours and be in San Francisco or drive two hours east and visit the snow in the winter. .
· I became a sometime card maker around 1998 when a stamp store opened up in Folsom, California. I was so amazed that people could stamp and color. I have some Hero Arts stamps that have the year 1999 stamped on them. So you see, I go WAY BACK! I didn’t do too much as a friend and I opened up a small wholesale ceramics business that catered to flower shops – the one of a kind type of thing. It really wasn’t until Hero Arts went online that I expanded my horizons. · I usually dive right in. I tend to have at least a couple scraps of paper or pre-printed and/or pre-colored images around my desk. Sometimes all it takes is to look at an image and I’m pulling markers out or digging for dies or embossing folders. I have a box with all my scraps in it to the right of my desk and I’ll usually find something to work with in there. When I do follow sketches, it tends to save me time. 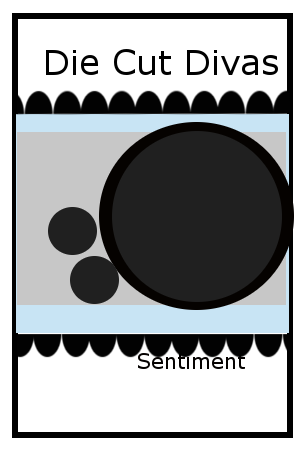 I know what shape I’m creating with and how the final card will look like. I tend to follow a sketch to the letter when I first use one, but then, I to experiment and try it on, so to speak. · Now that I’m one of the Die Cut Divas’ team, I usually make at least 3 to 4 projects and those are usually during a weekend. Sometimes it just comes together and others, it’s idea after idea and nothing works. · This is a difficult question for me. I’ve got my favorite markers (Copics first and now second is Ranger’s Distress Markers). Totally different looks. But for me, when I think of tools, I think metal and machines, so it’s got to be my Cuttlebug. I can emboss or work with dies. 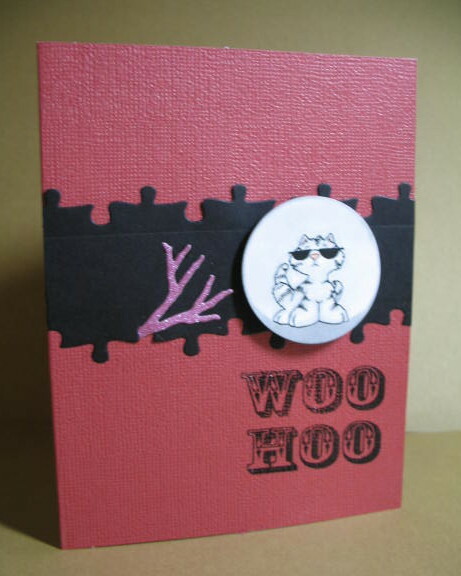 The dies and embossing folders fairly inexpensive and I keep it set up ready to go. Even when I kept it under my desk, it’s so quick grab and easy to work with. · My favorite thing to do is color. I’ve always loved to color, but never really had the opportunity to color to my heart’s content and now I do. There are so many choices now, pencils, water color pencils, and markers, Copics and Distress. I LOVE them all. I don't know about all of you but I have loved getting to know people on our regular Let's get to know guest spot. This month I thought it would be great to get to know one of our Divas' who works really hard behind the scenes & is ready to step in to help when she is needed. Who is this Goddess? Why it is none other than Arlene aka Clarian's Hawk. · I still haven’t found my style, however I find I enjoy Vintage and trying something different. I guess you could call my style the “quirky” style. I know Judy Jung calls it Artsy. I guess Artsy sounds better than quirky. I’m sure most of you know Judy as judkajudy on Flickr. · Sometimes I think I should make my style ONE style, clean and simple or have the ability to line images in a row with PATIENCE, however I like variety. So I’m thinking, I wouldn’t change my style. · I have not been published, but I haven’t really entered a card anywhere. And yes, we’ve made our own Design Team on Die Cut Divas, which does take up my time searching for and securing sponsors, as well as creating for our team. Die Cut Divas became a sponsored challenge blog this year and I have loved creating and getting to know our team, the same great team that continued supporting our Flickr group after the founder had to quit. · My blog is “a bit of this and that” at http://arlenesbits.blogspot.com/. Come visit sometime. Thank you Arlene for your wonderful interview & to take time out to share with us. As a fellow Diva I can honestly say without you I think this blog wouldn't be nearly as good as it is. I'm here with yet another sample card this time using this cute little Ducky from Eureka! Stamps. I was thinking it would make a great Easter card but ended up with this cute Spring card instead. I decided to flip the sketch sideways, this time. In addition to the Digi stamp I also used two Hero Arts Stamps. Isn't the Duck cute! I can see lots of uses for this Digi, Spring, Easter, Baby & Funny Cards or projects. Some more inspiration for you all. I'm sorry I haven't been about much of late. My laptop decided it's dying, the hard drive is kaput. But enough of the doom & gloom. Firstly I want to thank Arlene, Dawn & Hannah for helping out while I couldn't be here. Today I would like to share with you another card using the sketch. I really enjoy all the different ways one sketch can be used. 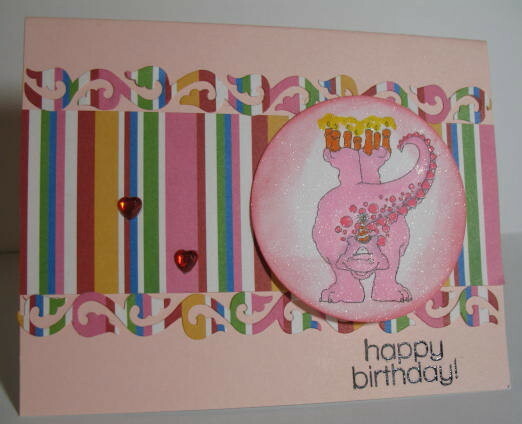 I kept this card fairly simple & used Art Palette from QKR Stampede. 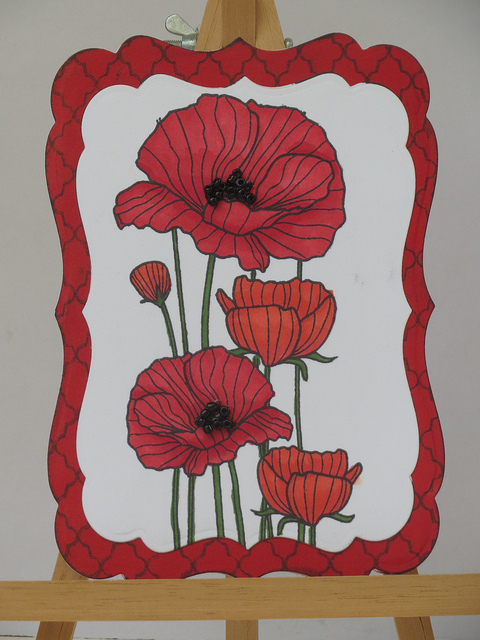 The banner sentiment is a die cut & I fussy cut around the Digi image. I also enlarged one of the paint splatters & printed it twice. I used Copics to colour the paints & then added Glossy Accents to them, to make them more realistic. I really like this for a Guy card. Although this would be a great card for any artists or art lovers. I can't wait to see what you all come up with. Thanks for playing along with us. I printed out the scroll along with some other Eureka images. It just didn't seem right to leave a scroll without any handwritten message of sympathy or love or some kind of message. The border dies, I've had for years and never used them but once and when I did, I didn't care for them. I DO NOW though! I care a lot. I had a scrap of card stock which may or may not be Tim Holtz and used it for the central panel.. I have an off-brand that has a similar flavor as Tim's card stock. I am happy with this. I like the design thanks to Paula and the neutral colors. I saw the Get Well Soon stamp and just had to use it. 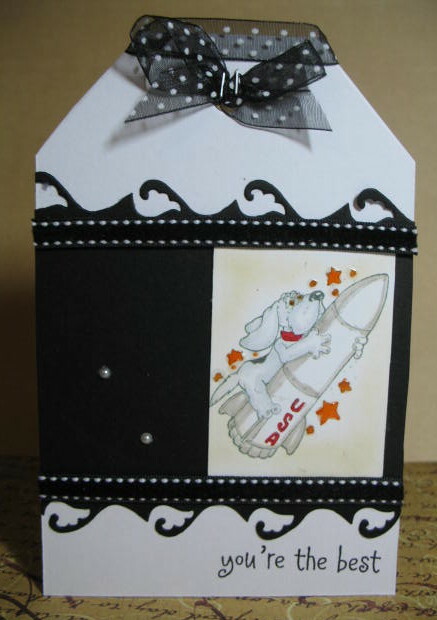 I hope you enjoyed this sample and be sure to join our Die Cut Divas challenge this month. Remember it's a sketch. To check out the sketch and enter the challenge, just click here! Did I say Eureka? That's what I'm talking about Eureka Stamps, that is. I think everyone will be making a STAMPEDE - I FOUND IT! I FOUND IT! EUREKA! We have two sponsors for the Die Cut Divas August challenge, Eureka Stamps and QKR Stampede. Eureka Stamps is the sister company of QKR Stampede and offers wonderful hand drawn calligraphy, verses, large alphabet letters and backgrounds There are fine art animals, whimsical Valentine characters and lots of cute Christmas and birthday stamps for cat and dog lovers too. 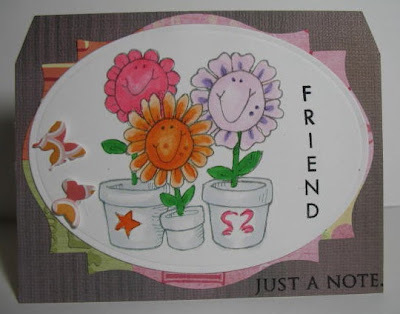 QKR Stampede offers unmounted rubber stamps, digital stamps, full sheets and supplies. Visit QKR Stampede for those unique, somewhat quirky styles with lots of humor and character. I followed Paula's fantastic sketch for the month of August. You have to love it and enter our August challenge. I love the digital parchment stamp as there is so much you can do with it. The image is blank the parchment devoid of writing or any inscription. It feels like a fresh slate on which to hand-write your thoughts with an old-fashioned fountain pen. Eureka Stamps offers both rubber and digital stamps. The Scroll Frame below comes in both. I think this would work well in a vintage style card too. Don't you? Paula is having technical difficulties and I'm sure had the best post set up for you on her computer ready to go, when KAPUT... virus gave it a nasty cold. Got my fingers crossed! As you know QKR Stampede and Eureka stamps are sponsoring our blog this month and I've had such fun with the images. Looking for rubber stamps or digital? They've got both. Here's a little more about QKR Stampede. Paula created a fantastic sketch and I've had fun playing for the past week, so I do have an inspiration card for you today. (I'm still sending out get well thoughts to her computer). Please join us in our challenge this month. Congratulations Karen. I've send you a Flickrmail. and a huge thanks to all our entrants. Some fabulous works of art for July's challenge. It's Paula here to host this month's challenge. I've opted for a sketch since I love using them so much. How about you? 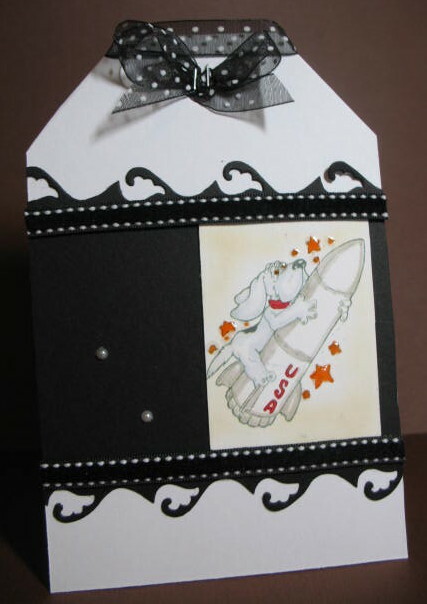 I find they are a great starting point for making a card, project or LO. I'm constantly surprised at all the different ways they can be used. Often I'm left just so inspired on other people's take of these sketches. This month we are being sponsored by two sister companies Eureka! Stamps & QKR Stampede. Believe it or not, this is my very first sketch that I ever made & am so glad to be sharing it with you all. Now for the fun stuff let's see what my fellow Beautiful Diva's did with this sketch to inspire you all. Dawn has used Cool Cat with Shades from Eureka. Don't you think Dawn's card is simply wonderful. 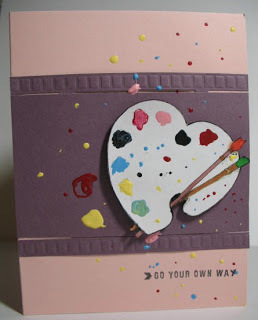 Arlene used Art Palette by QKR for this gorgeous card. I just love the paint splatters don't you? I used this cute Lion Digi from QKR Stampede. Remember if Digis aren't your thing they carry a great range of Rubber Stamps as well. Don't forget to checkout their blog & Facebook page. Don't forget to stop by tomorrow to see who has won last month's challenge & receives seven free Digi images from Bugaboo. I can't wait to find out!